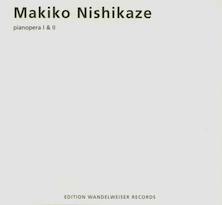 What struck me most about Makiko Nishikaze’s piano music, when I heard it for the first time, was its waywardness. In a kind of musical stream of consciousness, delicate melodic strands floated quietly and unpredictably over the entire keyboard like the disconnected thoughts of a daydreamer. And yet it sounded perfectly natural and inevitable: some mysterious logic was holding it all together. Immediately I began thinking about how I would interpret this music, and in May, 2002, had the opportunity to do so when she entrusted me with the first performance of her 70-minute long “Piano Islands”. Makiko Nishikaze liked my interpretation, and decided thereupon to compose a further piano piece, the two-part “pianopera”, especially for me. atically, but with very flexible systems, and that the pitches, intervals and durations she uses are derived from sets of proportions. Before beginning “pianopera I” she carefully measured the lengths of my arms and fingers, the measurements obtained providing the set of proportions for the piece. I was reminded of composers like Schumann and Ravel deriving themes from the letters of their dedicatees’ names. In 2003 Makiko Nishikaze was awarded a grant to work at the Villa Aurora in Los Angeles, formerly the home of novelist Lion Feuchtwanger and a meeting-place for writers and composers who, like him, were exiles from Nazi Germany. While she was there I was invited to give the first performances of “pianopera I” and “pianopera II”, which took place on the 23rd of April in the library on an old Blüthner grand piano that had once belonged to the composer Ernst Toch. And what is the plot of this opera in two acts for piano? That’s up to you, Dear Listener.